The Department of Homeland Security’s “If you see something, say something…” is not too far off from this paradigm– encouraging citizens to rat each other out to the police for the mere suspicion of potential wrong-doing. 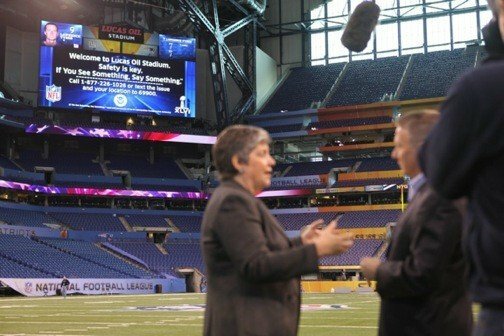 DHS Secretary Janet Napolitano even made a special appearance at last Sunday’s Super Bowl to get the message out about ‘public vigilance,’ and ensure that the entire city of Indianapolis was blanketed with advertisements from her Big Brother campaign. The IRS has been encouraging this type of behavior for years, rewarding citizens with a share of collections for anyone who snitches on potential tax cheats. Last year the agency upped its reward payout for tax informants, topping out at a full 30%. A few months ago, the Mayor of Newark, NJ announced a similar program designed to reward citizens for snitching on gun owners. According to the mayor, “We don’t even have to have a conviction,” for an informant to get paid a cool $1,000 cash. Rat out your neighbor, get paid. Simple. In the financial system, there are droves of civilian agencies that have been coerced into becoming government spies. As we discussed a few weeks ago, everyone from bankers to brokers to gold dealers are obliged to submit ‘suspicious activity reports’ to the federal government. They even have minimum quotas. What’s more, these so-called “SARs” must remain top-secret. It’s a crime for your banker to inform you that you were the subject of a suspicious activity report. Yesterday, the Financial Crimes Enforcement Network (FinCEN), the federal agency which oversees the legions of unpaid government spies, added a few more businesses to the list. Now non-bank mortgage lenders and originators must ‘assist law enforcement’ by submitting suspicious activity reports. The rule will take effect in the spring. What’s ambiguous is whether or not it will apply to -individuals- who hold and issue private mortgages. Individuals who finance the sale of their residence are exempt. Individuals who finance an investment property/properties that they own may be subject to the rule. Businesses who own and finance investment properties are more than likely subject to the rule. Individuals and businesses who finance properties that they do not own are subject to the rule. Individuals and businesses who accept a residential mortgage application are subject to the rule. In other words, if you loan money to someone to buy a house, you might just become the next unpaid government spy. Congratulations. What’s incredible is that FinCEN came up with this rule all on its own. There was no Constitutional legislative progress. Nothing was submitted for debate on the House floor, or for the President’s signature. This is not a law. It’s simply a new policy that a federal agency decided to impose, in its sole discretion. And it happens every single day across the hundreds of federal agencies in Washington– a sort of ‘self-legislation’ which creates thousands of pages of new regulations that each and every American is obliged to obey. In the case of FinCEN, the agency has conjured a rule creating (by their estimate) 31,000 new unpaid government spies. You might be one of them. And in the coming months, you can expect more rulings that will apply to other professions– real estate agents, pawn brokers, and just about anyone who deals in cash.